Pajeon, especially Haemul Pajeon, was always served at parties at our home when I was little. 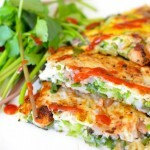 I have been looking for the recipe of this very yummy seafood green onion pancake for a long time. I did not have the recipe because it is not a dish that my mom or dad made but it was a dish that was made by a professional chef who came to cook for my parent’s Diplomatic dinner parties. Mrs. Shim was her name and all her food was just really delicious. So when we had these dinner parties, I waited and waited until dinner was all served (at least 9pm or so?) so I could have the leftovers because they were all so good. 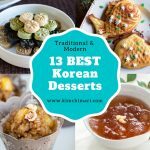 I prayed that the guests had small stomachs or was too proper and did not ask for seconds.. 🙂 Also another way I got to taste Mrs. Shim’s food was to hang around in the kitchen all day and seek opportunities for tasting or cleaning up defective pieces that did not meet her standard. This special kind of Haemul Pajeon is called Dongrae/Dongnae Pajeon (동래파전)- named after the region of Dongrae/Dongnae which is basically the area of the city of Busan today. For some reason, this pancake loaded with green onions and tons of seafood has lost popularity over the years and I almost forgot about it. But recently, I was reminded of this fabulous pancake when my nephew SW bragged about the delicious Dongrae Pajeon made by his wife EH who is from Busan. So.. thank you EH for the inspiration!! 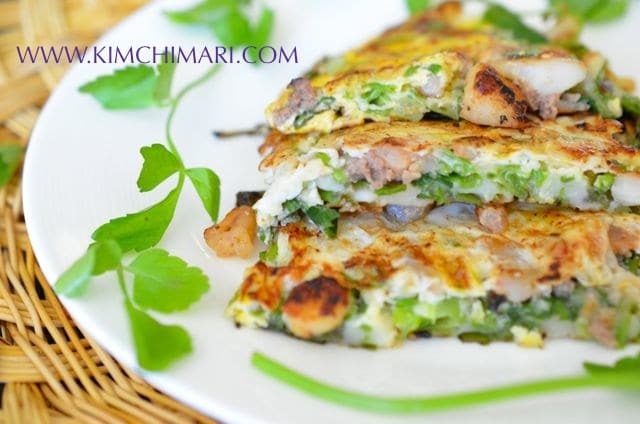 Unlike the common, everyday Korean Pajeon (Green Onion Pancake) which is made by just mixing everything together – batter, seafood, vegetables and all – Dongrae/Dongnae Pajeon is made in several steps or layers which is more work but definitely worth the effort. It is much more flavorful because there is less batter and more seafood and tons of green onions. OH! BTW – I provide 2 sauces in the recipe but you can certainly make just one. Chokanjang is the usual soy sauce served with most Korean Pancakes but try Chogochujang, I made it at the suggestion from my nephew’s wife and I was surprised how good it tasted together! 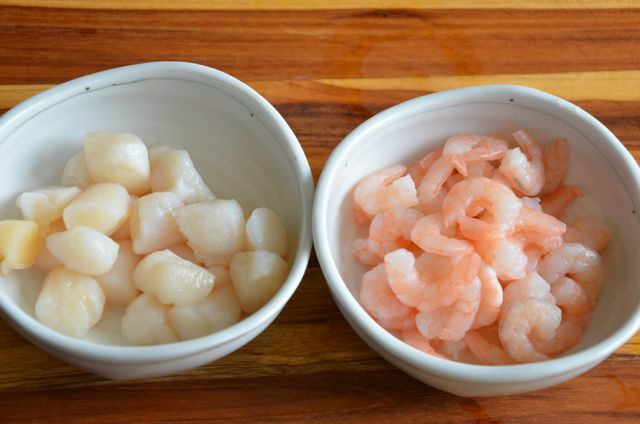 *** If scallops or shrimps are frozen, thaw them in the fridge for several hours or overnight. 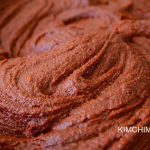 Make Chogochujang sauce by mixing gochujang, vinegar, sugar and sesame seeds. 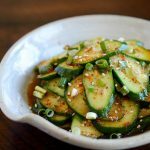 Make Chokanjang sauce by mixing soy sauce, vinegar, sugar and water. Set aside. Clean green onions and minari. Cut green onions 6 in (15 cm) long.This is usually 1/2 of the full length of green onions sold in US. 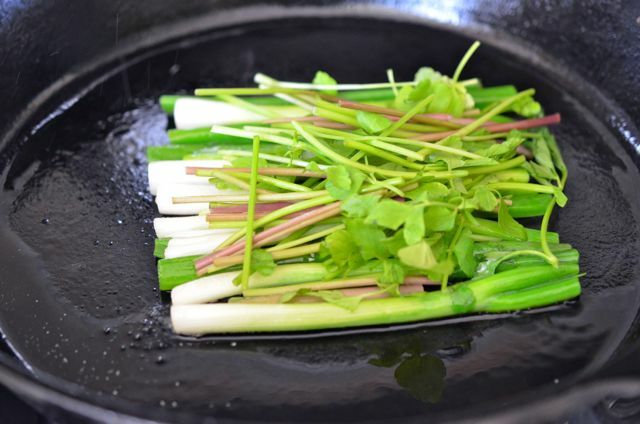 The green onions used for Pajeon should be young and tender – called 실파(shilpa) in Korean. 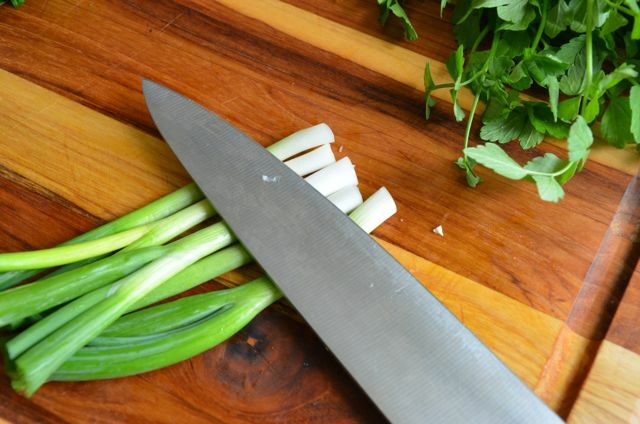 If your green onions are any thicker than 1/2 in (1 cm) then cut it in half or smash the white part with the side of your knife to make it tender. My thawed shrimps (pre-cooked) and bay scallops. Bought frozen from the Korean market. Cute aren’t they? Chop scallops and shrimp roughly into big chunks. 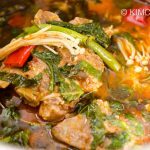 Season ground beef by adding soy sauce, mirin, maesil syrup or sugar, chopped garlic and sesame oil. In another bowl, make batter by mixing flour + rice flour + sweet rice flour and anchovy stock. 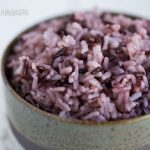 Rice flour likes to settle to the bottom so stir it well and be sure to stir right before you use it. Heat a nice thick pan (cast iron is great) on med-high heat. Pour about 2 T oil into pan. Pour batter over green onions and minari. 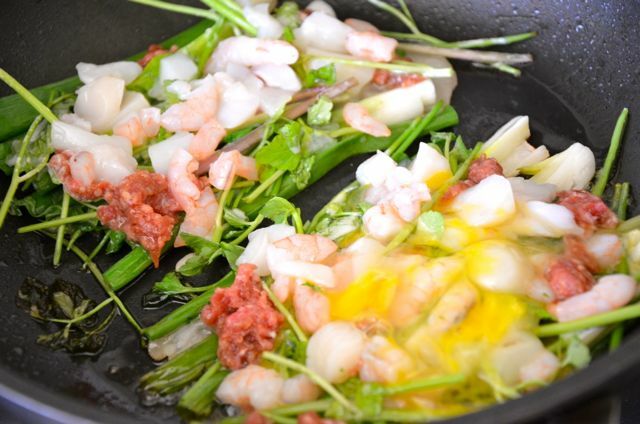 DO NOT try to cover all the green onions with the batter – you will end up adding too much batter. Pancake will taste doughy if you have too much batter. Pour about 2-3 Tbs per pancake – just enough for green onions to hold together. Quickly (lower heat to med. if you think it’s burning) dot the pancake with ground beef + scallops + shrimp. Using your hands works best – just be careful! Top with 1/3 of whisked egg (pancake on the right). If you like eggs, you can use up to 1 whole egg per pancake. Turn the pancake over to cook the other side. Let it cook for another 2 min or so until pancake is nicely browned. 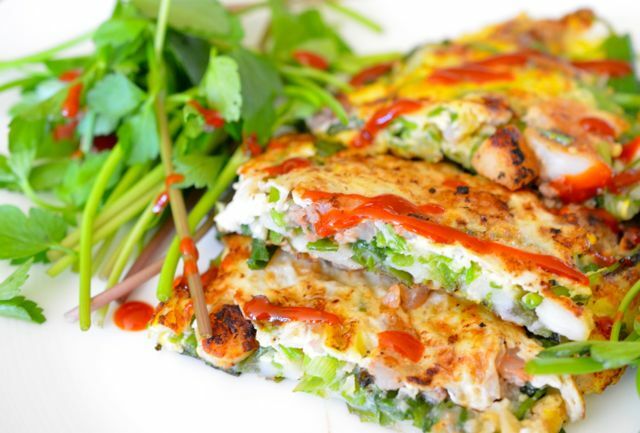 Unlike the common, everyday Korean Pajeon (Green Onion Pancake) which is made by just mixing everything together – batter, seafood, vegetables and all – Dongrae/Dongnae Pajeon is made in several steps or layers which is more work but definitely worth the effort. Clean green onions and minari. 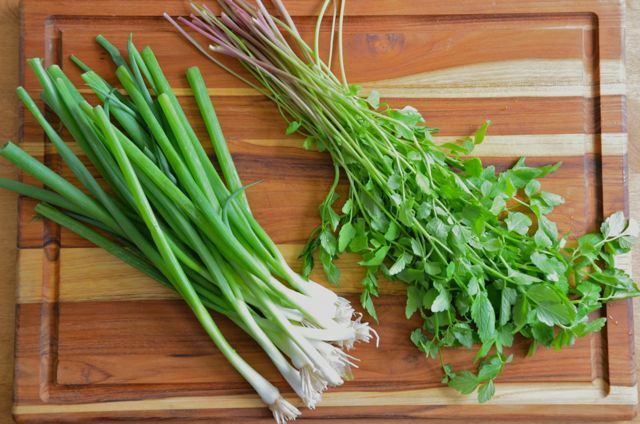 Cut green onions 6 in (15 cm) long or 1/2 of the full length of green onions sold in US. 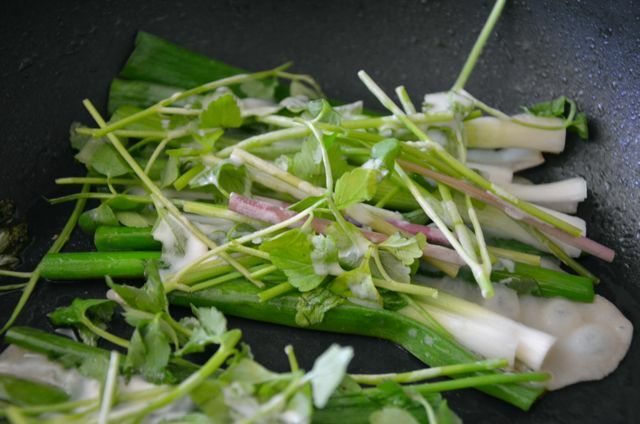 The green onions used for Pajeon should be young and tender - called (shilpa) in Korean. 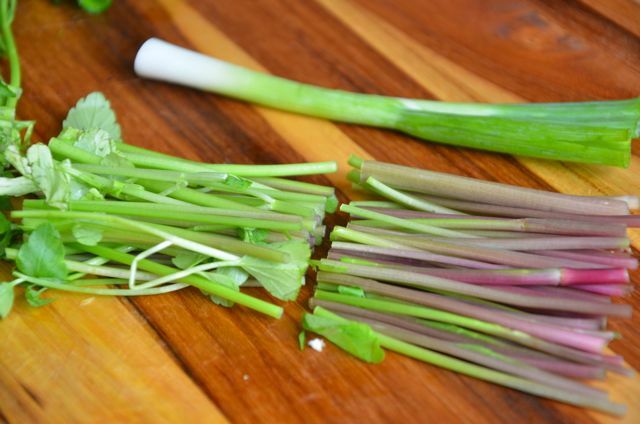 If your green onions are any thicker than 1/2 in (1 cm) then cut it in half or smash the white part with the side of your knife to make it tender. Cut minari 3 " (7 cm) long. About 1/2 length of your green onions from 3. Reason for cutting minari shorter is because they are quite fibrous and will be too chewy if left too long. Normally, only minari stems are used but these minari are quite young and tender so use the leaves too. 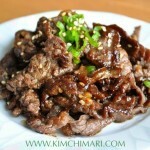 Season ground beef with soy sauce, mirin, maesil syrup or sugar, chopped garlic and sesame oil. In another bowl, make batter by mixing flour + rice flour + sweet rice flour + anchovy stock + salt. 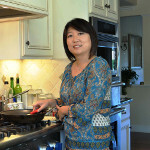 Rice flour likes to settle to the bottom so stir it well and be sure to stir right before you use it. Now we are ready to make the pancake! You should have all the prepared ingredients next to your pan. Layer green onions in pan and then minari on top. Pour batter over green onions and minari. DO NOT try to cover all the green onions with the batter - you will end up adding too much batter. Pancake will taste doughy if you have too much batter. Pour about 2-3 Tbs per pancake - just enough for green onions to hold together. Quickly (lower heat to med. if you think it's burning) dot the pancake with ground beef + scallops + shrimp. Using your hands works best - just be careful! 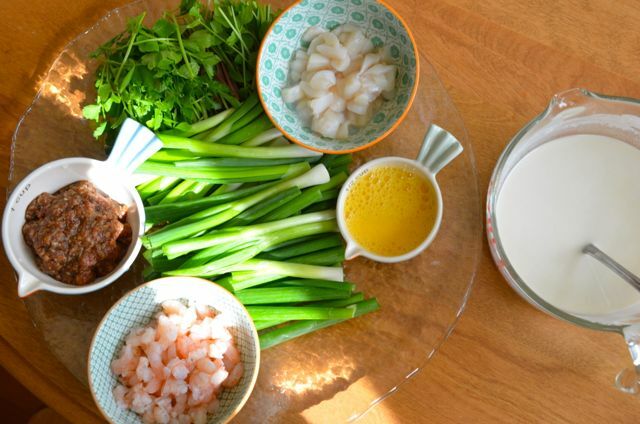 If scallops or shrimps are frozen, thaw them in the fridge for several hours or overnight. 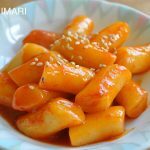 Cho Gochujang is the original sauce that goes with Dongrae Pajeon but you can also serve Cho Ganjang sauce for a non-spicy option. 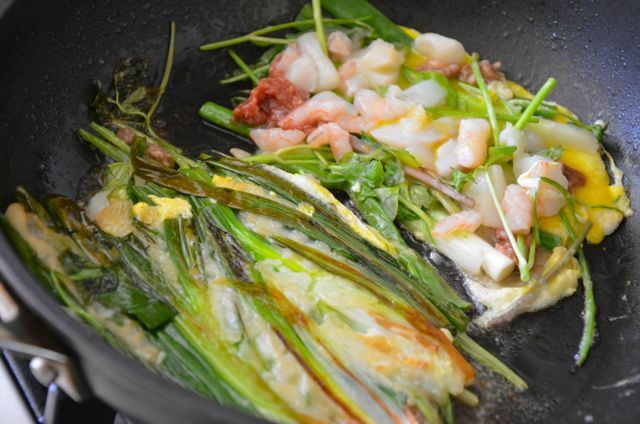 This Dongrae Pajeon (Korean Seafood Green Onion Pancake) pairs wonderfully with Korean Rice Wine – Makgeolli/Makgeoli/Maguli (막걸리) so give it a try!! 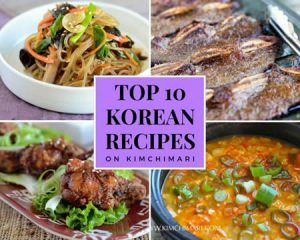 * *Calories do NOT include the gochujang or soy dipping sauce as they are optional. 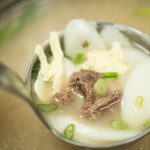 My wife is from Busan, and she makes something very much like this on rainy days. It is truly delicious! Thank you for all the amazing recipes. I look forward to reading all of them, and trying more than a few. Though I’m American, I spent several years in Seoul in the 1980s and fell in love with the food and the people there. 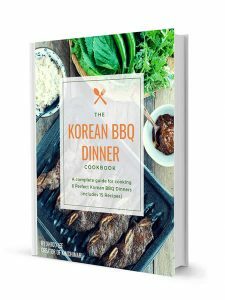 Yours is one of the very best Korean recipe sites I’ve found so far.